This entry was posted in Misc and tagged indie publishing, publishing, self-publishing, ted talks, tedx. Bookmark the permalink. Hark back to when you were their age. Are you there yet? OK. Now, in walks Richard Ridley who cares enough about inspiring your creativity to dawn a wig. I think that would have made quite an impression on you. And I’m gonna bet, they remember your talk. Kinda hard not to remember a bearded man in a wig. Now that I think about it. In that wig, you look just like the bank robber I walked past in Bank of America years back! A bearded man with a wig, wearing a winter coat in the summer to hide his fake bomb. Hmmmmmmmmmmm. Were you ever a disgruntled State employee? Just to clarify, I didn’t wear a wig to the event. 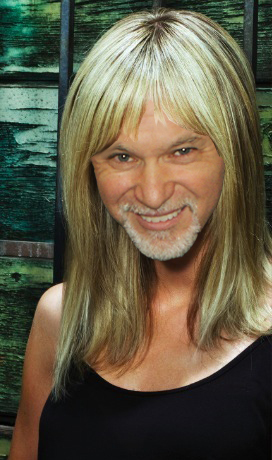 I created a series of disturbing photoshop images featuring my face on Kaitlin Olson body. Thanks, Brian. It was a pleasure to meet you at the event, and I took mental notes on your “engagement” speaking style. I loved how you got the kids involved.